When I learnt Reiki in 2001, my Reiki Master used to offer Reiki Shares in London and I loved attending them. They felt very supportive and beneficial. It was not easy for me to attend her Reiki Shares regularly though as I had to arrange for a baby sitter – my children were about 2 and 6 at the time. So I started hosting Reiki Shares quite early in my Reiki journey, probably around 2003. I feel attending the Shares helped me to stay with the Reiki Practice over the years. As I started teaching Reiki in 2008, I continued to offer Reiki Shares. I wanted to share what I had found helpful on my own journey as a new Reiki student. Around 2011, I felt drawn to opening the Reiki Shares to all Reiki students, practising other forms of Reiki too. This was a big change from hosting the Reiki Shares for students practising Reiki, Usui Shiki Ryoho, the form of Reiki that I had learnt and taught. It was not an easy decision to open my doors to people I did not know, practising Reiki in many different ways. Reiki is probably practised in more than 100 ways around the world! I found my way through this maze of different forms of Reiki, by requesting people to do the hand positions that I demonstrate during the Reiki Share, feeling that I can support only what I know. I try to make sure people understand that I am requesting them to do these hand positions just during the Reiki Share, that I am not asking them to change the way they have learnt to practise Reiki, and they need to honour the teachings that they have received from their Reiki Master – just as I need to honour my own. On a practical note, I feel that I have to do this as we practice shared Reiki treatments usually on one, and sometimes on two treatment tables. 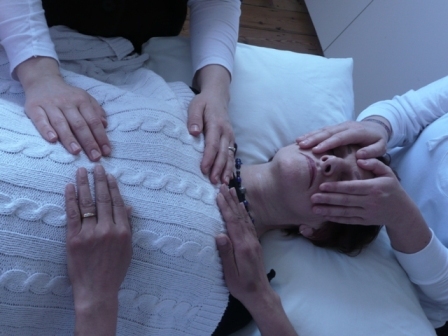 So there are several people giving a Reiki treatment to the person lying on the treatment table, at the same time. If people were working on a one-to-one basis with each other, perhaps I may not have to ask them to do the same hand positions. I am so glad that I decided to listen to my heart and opened my Reiki Shares to welcome all Reiki students – not just my own! Each Reiki Share, it feels as if an energy field gets created. Every person who joins the Reiki Share contributes something unique to this energy field, in a way that only they can. It feels as if together, with the help of this group energy, we are able to move some big heavy rocks that we may not be able to move on our own, by ourselves. I continue to meet some amazing people through my Reiki Shares. I cannot help wondering if our paths would have crossed but for the open Reiki Shares! If our paths have crossed at my Reiki Share, I leave you with this quote from Hafiz “Your heart and my heart are very, very old friends.” I would also love to hear about your experience of the Reiki Share(s). You can either leave a comment below or email me.